Still On Tour: At the Vancouver Writers Festival, we take a break from readings and panel discussions to enjoy a boat tour of Vancouver’s English Bay. (Left to right) Kenneth Oppel, Jan Redord, me, Hal Wake. Craig Davidson, Adele Weber and Kate Harris, aboard the Seren Claer, skippered by Mark Schneider (who took this photo). On Tour, Oct 2018: After joining Esi Edugyan, Elizabeth Hay and others at Calgary Wordfest, Merilyn and I are in Whistler for their fabulous Writers Festival. Here we are on The Walk to Lost Lake, with fellow writers: (left to right) me, Merilyn, Grant Lawrence, Charlie Demers and Dave Bidini, with Lost Lake in the background. Birding on Pelee Island, Ontario, during the 2018 spring migration, on a cold, wet weekend in May. (Left to right:) Fiona Campbell, guest birder Sean Dooley, me, and guest author Madeleine Thien. We saw 106 species out of a recorded total of 150 species seen over the weekend. Photo by Danny Catt. I recently learned that Up from Freedom has been picked by BookNet Canada’s reading list, “Loan Stars” as one of the best books coming out in August. To subscribe to this list, visit their site here. Summer 2018: “What Did Don Quixote Eat on Saturdays?” an essay. Fall 2018: “For Armand Ruffo,” a poem. Winter 2018/19: “Robinson Crusoe: The First Antislavery Novel,” an essay. I’m delighted to announce that my forthcoming novel, Up from Freedom, will be published by Doubleday Canada. The publication date is August 8, 2018. The novel takes place in the U.S. from 1848 to 1850 – from the end of the Mexican-American War to the passing of the Fugitive Slave Act – and follows the lives of two main characters: Virgil Moody, the son of a Georgia slaveowner, and Tamsey Lewis, a freed slave who thinks she has found safety for herself and her family in Indiana. Both discover that the tentacles of slavery reach deeper than their desire for freedom, or the bonds of love. My first novel, Emancipation Day, was the most-checked-out work of fiction in 2017 at the Waterloo Public Libray. My novel was selected earlier in the year for the region’s One Book, One Community program, in which readers in the Kitchener-Waterloo Region were encourged by libraries, bookstores and schools to read one book — mine — and to attend events and readings to discuss the issues raised by the novel. According to Alannah d’Ailly, manager of collections at the Waterloo Public Library, the fact that Emancipation Day was borrowed from the library stacks more often than books by John Grisham and James Patterson “clearly shows that the premise behind One Book, One Community absolutely works.” People want to read books, they want to read Canadian books, and they want to read “books that challenge them.” Click here for the full story in The Record for December 31, 2017. The Windsor Symphony Orchestra is preparing to commission an opera version of Emancipation Day. I recently met with WSO executive director Sheila Wisdom and music director Robert Franz, who believe that Emancipation Day and the WSO are a perfect fit. I completely agree. The novel is set in Windsor, has a lot of music in it, and deals with issues of race and belonging that are still prevalent today, and not only in Windsor and Detroit. I’m very excited by the prospect of seeing and hearing E-Day on the operatic stage. 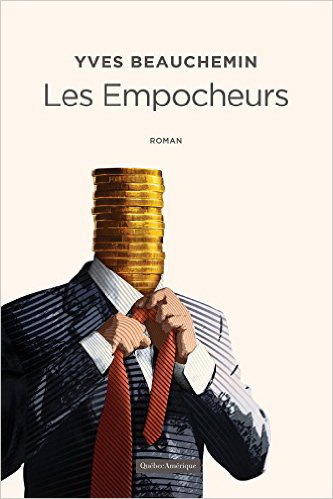 My translation of Yves Beauchemin’s controversial new novel, Les Empocheurs, is scheduled to be published by House of Anansi Press on Sept 15, 2018, under the title: The Accidental Education of Jerome Lupien. The hero of the novel is a young man, Jérôme Lupien, who gets caught up in a web of conspiracy and fraud at the highest levels of Quebec’s social strata. His boss, Séverin Sicotte, bills himself as a “lobbyist,” but what he does is bring top-level politicians into clandestine contact with the CEOs of major construction companies. Lots of money changes hands, and as a result, shoddy bridges and highway overpasses are built. “It’s not exactly a roman-à-clef,” Yves said when I spoke with him in Moncton in April. “If it was, I’d be in jail by now.” But it comes very close to some recent construction scandals that took place in and around Montreal. I predict that sparks will fly.